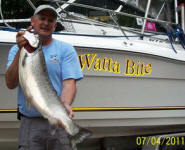 Celebrating 12 seasons of Watta Fishing Report from Glen Arbor, Michigan near Sleeping Bear Dunes. Thank you for making our Fishing Report so much fun! Watta Bite Congrats to Mike on his catch of the day. The weather was great and the Wind was blowing a little hard. Watta Bite congrats to Steve, Alexander, Julie and Glen on their catch of the day. Great day to be out on the lake. Watta Bite congrats to Kevin and Bill, Skye, and Bella on their catch of the day. Great time to get out on the Lake for some fall fishing. Watta Bite congrats to Shane, Sebastian, Eymahnia, Chad, Martin and Becky on their catch of the day. Great fall day out on the lake. Watta Bite congrats to Jeremy, Don and Jesse on their catch of the day. Great catch of Coho and King Salmon. Watta Bite Labor Day weekend congrats to Dennis, John and Francine on their catch of the day. What a great day to be out on the Lake. Watta Bite congrats to Nathan, Misty, Briana, Brian and Shawn on their Friday catch of the day. Great start to the Labor Day weekend. Watta Bite Congrats to Rick and Eileen on their catch of the day.. Great day to be out on the Lake. Watta Bite congrats to Max on his catch of the day.. Great day to be out on the Lake. Watta Bite congrats to Jack, Cody, Paul,Danielle and Brett on their catch of the day. Great day to be out on the lake. Watta Bite congrats to John, Douma and Ben on their Lake Trout catch of the day. Great day to be out on the lake. Watta Bite congrats to Tyler, Ryan, Pete and Ted on their Lake Trout catch of the day. Great day to be out on the Lake. Watta Bite congrats to David and Morgan on their catch of the day. Great day for fishing out in the rain. Watta Bite congrats to Dan, Adam, Aaron and Whitney on their catch of the day. Caught the biggest lake trout of the season on this trip weighing in at 18lbs. Watta Bite congrats to Jim, Eric, Matt on their catch of the day..
Watta Bite congrats to Zach, Luke and Reese on their catch of the day. Watta a lot of fun out on the Lake. Watta Bite congrats to Mary, David, David and Adelaide on their catch of the day. Great times on Lake Michigan. Watta Bite Congrats to Stuart, Steve, Doug and Layne on their Lake Trout catch of the Day. Good day to be on the Lake. Watta Bite Congrats to David, Marge, Fred and Kristin on their catch of the day. Great day to be out on Lake Michigan. Watta Bite Congrats to Dan, Doug, Kevin and Jim on their Lake Trout and Salmon mixed catch of the day. Watta Bite congrats to Ron and Don on their Lake Trout and Salmon Catch of the day. Watta Bite congrats to Michael, Travis, Kaitlyn, Alexandria on their catch of the day. Great day to be out on Lake Michigan . Watta Bite congrats to David, Rod, Bodi, Jay on their catch of the day. Good times on Lake Michigan. Watta Bite congrats to Wayne, Karen and John and Silas on their catch of day. Watta Bite congrats to Rebecca, Scott, Nick and Will on their catch of the day. Great day to be out on Lake Michigan. Watta Bite Saturday Congrats to Mark, Karen, Duncan, Danielle and Dylan on their catch of the day. Watta Bite congrats to Dave and Joe on their catch of the day. One of which was a 20lb King Salmon. Thanks for a great trip. Wednesday, July 27, 2016 Watta Bite Congrats to the Dahlquist family on their catch of the day. Tuesday July 26, 2016 Watta Bite congrats to Robert, Steven, Tom and Joe on their catch. Watta Bite Monday congrats to Tom, Elke, Jena and Shane on their catch of the day. Watta Bite congrats to Stacey, CJ, Hannah Chris and Josh on their catch of the day. Watta Bite congrats to Ben and Greg on their catch of the day. Watta Bite congrats to Ellen, Leon and Ben on their catch of the day. Watta Bite Saturday Congrats to Jennifer, Stacey, Will, William, Lauren and Greg on their catch of the day.. A good time was had by all. Watta Bite Bachelor party congrats to Chris and Crew. This was a 2 boat trip but we only got pictures from one of the boats catch. Watta Bite Wednesday congrats to Todd, Owen, Bob and Graham on their Catch of the day. The BIGGEST fish of the season was caught today before seasickness struck and cut the trip short. Watta Bite Windy Monday Congrats to Caroline, Eric, Evan, and Duncan on their catch of the day. Glad we were able to get you out on the Lake. Watta Sunday congrats to Tom and Adam on their catch of the day. Good day out on Lake Michigan. Watta Bite Congrats to Abraham, Hunter, Thomas, and Daniel on their catch of the day. Great day to be on the Lake. Watta Bite afternoon congrats to Rebecca, Kevin, Grace, Colin and John on their catch of the day.. A good time was had by all. Watta Bite Tuesday morning congrats to Janet, Savannah, Tim, Val, Thomas and Thomas III on their catch of the day.. A good time was had by all. Watta Bite afternoon congrats to Lauren and Allen on their catch of the day. Great way to spend the day out on the Lake. Watta Bite Fourth of July morning congrats to Scott, Aidan, Aimee, Joe and Leah on their catch of the day. Great way to spend the morning out on Lake Michigan. Watta Sunday congrats to Joe, Steve, Bruce and Andy on their catch of the day. Good day to be out on the water. Watta Bite Saturday afternoon congrats to John, Mason, and Richard on their catch. Good times and great weather. Watta Bite Saturday morning congrats to Dan, Don, Alexandra, Matthew and Katie on their Catch of the day. Watta Thursday Congrats to Tamika and Kevin on their catch of the day. Watta Bite Congrats to Allen, John and Ben on their Wednesday catch of the day. Watta Tuesday congrats to Darren, Dalton, Andrew, Cooper, Michael and Will on their catch of the day. The winds subsided so we were able to find the fish. Watta Bite Saturday congrats to Nicholas, Stacy, Raylei, and Kylie on their catch of the day. Good times and its never too early to take your kids fishing.. Good times. Watta Thursday congrats to Maureen, James, Joseph and Jess on their catch of the day.. A good time was had by all and the weather was beautiful. Watta Bite Tuesday congrats on a limit of Lake Trout to Terence, Christopher, Chris and Caroline. A good time was had by all. Watta Bite Father’s Day Congrats to Steven, Leroy, Tom, Fredy, Johnathan and Brennen on their catch of the Day. Watta Bite congrats to James, Jon and Connor on their catch of the day. Sure was a lot of fun. Watta Bite congrats to Kevin, Giovanni, Megan, Nathaniel and Jacob on their Monday catch of the day. A good time was had by all. Watta Saturday 2 boat trip with both boats limiting out. Congrats to Arthur, Mike, Eden and Moses who were the Watta Bite crew. Congrats to the other boat on their catch also sorry we don’t have all of your names. The Watta Bite crew is back on the fish. Congrats to Jonathan, Edward, Matthew and William on their catch of the day. After 3 days of high winds and storms and the lake being stirred up, the Watta Bite crew still came in with fish. Watta Bite congrats to Domenic, Michael, Joe, Nick and Doug on their catch of the Day. The Lake Trout were biting even though the wind and the weather didn’t want to cooperate. Watta Bite Memorial Day congrats to Deb, Sandy, Mary, Taylor and Jim on their catch of the day. Great way to spend the day out on the Lake. Watta Bite Memorial Day weekend congrats to Larry, Autumn, Adam and Ben on their Lake Trout catch of the day. Great trip and great fun. Watta Bite Wednesday Congrats to Denise and Jason on their Catch of the day. Watta Bite Sunday congrats to Adam, Autumn, Dario and Rob on their Lake Trout Catch of the day. Great fishing and good times. Watta Bite Congrats to Ryan, Kyle, Brandon, Michael, William on their Lake Trout catch of the day. Great times for the start of the Bachelor Party weekend. Watta Bite COLD morning Congrats to Ben, Ben and Captain Bill on their catch of the day. The weather was only about 38 degrees but the Lake Trout were biting good. The season has officially opened. Captain Bill is taking the picture and a nice limit of Lake Trout was caught. We made it home in time for Mother’s Day dinner. Watta Mother’s Day Lake Trout Catch!